> Dried Chilies>De Arbol>Dried De Arbol Chile 2 oz. Dried De Arbol Chile 2 oz. 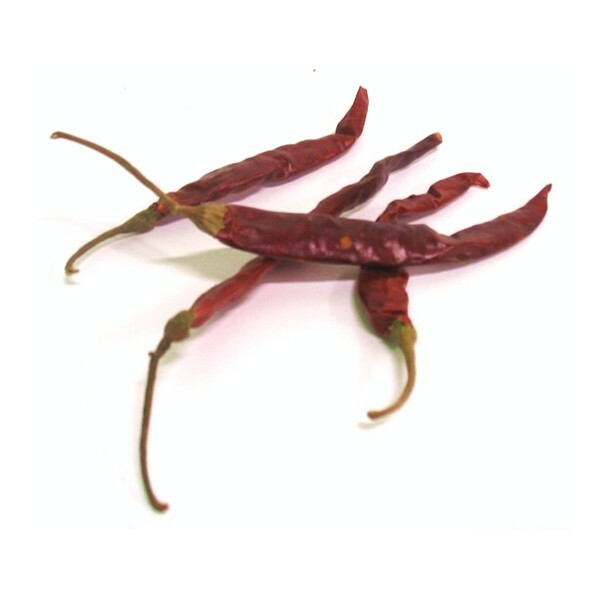 The arbol chile is a long, slender and hot pepper, and commonly used in Mexican salsas. Just crush a few and add to soups, Mexican food dishes, sauces, or add a little water, or beer to rehydrate the chilis and us them in place of fresh peppers. De Arbol chilies are very hot but they also have a nice nutty flavor. Closely related to cayenne peppers, De Arbol chilies are bright red, 2-3 inches long and pointed. Thinly fleshed, De Arbol chilies have a searing, acidic heat and are primarily used in powdered form to make sauces, but can also be found in soups and stews. Chile de Árbol can be used in any dish to add heat and spice, especially chili, salsa, and hot sauces. It usually only takes a few peppers added to a pot for significant heat. Toast them and then blend with tomatillos, onion, garlic and a little water for a great table salsa. They come in handy anytime a little spark of intense heat is required. Chilies are loaded with vitamin A, a potent antioxidant and boost to the immune system. Capsaicin, which it's present in chilies, has an antibacterial effect, so food cooked with chilies keeps for longer without spoiling. Chilies are rich in vitamin C and are believed to have many beneficial effects on health. The pain caused by capsaicin stimulates the brain to produce endorphins, natural opioids which act as analgesics and produce a sense of well-being. To reconstitute dried Chili pods, remove stem and seeds. Place chilies in a pot of water that is just about to boil. Remove from heat and allow to soak for 20-30 minutes or until tender. Once chilies are reconstituted, place in a blender or food processor to chop.